Thomas Stearns Eliot published “The Waste Land” in October of 1922 in The Criterion. It was written during a difficult part of his life and it is dedicated to Ezra Pound. In T. S Eliot’s The Waste Land, Harold Bloom argues that “as a quest for a way out of the waste land of the world of the early 20th century, The Waste Land is a description of that territory, and of the people who live in it and the quality of the lives they live” (26). In other words, Bloom sees the poem as Eliot’s way of portraying the landscape of a particular time and place. Other critics, like Harriet Davidson and Michael H. Levenson, interpret “The Waste Land” on more micro levels focusing instead on the themes of the proper and the improper and the unreliable narrator, respectively. While I agree with most of their arguments, I view Levenson’s and Davidson’s interpretations as supporting statements to Bloom’s primary argument rather than equal alternatives to his interpretation. Bloom presents his argument as a response to the questions that Eliot asks within the poem. The central questions ask “What are the roots that clutch?” and “what branches grow/out of this stony rubbish?” (Eliot 19-20). In response, Bloom argues that these are the issues that “the poem confronts throughout its five cryptic fragmented sections” (26). In particular, Bloom states that images of “branches” and “stony rubbish” suggest that the poem as a whole “will examine people’s lives (branches) and the culture (stony rubbish) in which they live” (26). I agree with this interpretation and will further add that these images of roots and branches are also related because they are both parts of a tree. By presenting images that are parts of a tree, Eliot presupposes growth thus allowing him to portray toughness, a quality required to grow in a landscape of “stony rubbish” (20). “Stony rubbish” as a result has both a literal and metaphorical interpretation . Literally, “stony rubbish” refers to a tough and dead land, perhaps a waste land that is not conducive to farming. Metaphorically, the phrase refers to an overall tough and dead culture which produces nothing fruitful or lively required for artistic awakening. Bloom agrees, arguing that Eliot asks rhetorical questions in order to cement the idea that roots have to clutch to this stony rubbish of a land. He furthers reinforces his own argument by asking a set of his own rhetorical questions such as “how can people live well if the culture is broken, harsh, and cannot support them?” and “How can there be a civilization worthy of mankind and how can mankind itself be whole, wholesome, and create a worthy culture, if the environment in which it grows undermines life rather than nurtures it?” (Bloom 26). Bloom argues that Eliot’s question, “What are the roots that clutch?” (19), ponders the idea of creating roots once rootlessness has been established. Roots require nourishment in order to foster growth because they need something to hang on to (Bloom 26). As a result, it is unlikely that great growth can be established in a barren land. Beyond literal roots, metaphorical roots represent traditions and culture that take decades and generations to establish. Thus once a civilization or a people discard their traditions they essentially discard their metaphorical roots, leaving them with nothing but barren ground on which to build their future. This interpretation is in accordance with Harriet Davidson’s argument about the proper and the improper within Eliot’s “The Waste Land.” In particular, Davidson argues that Eliot plays around with themes of the proper and improper within the poem. In agreeing with this interpretation, I would like to take it a step further and argue that it is this lack of thematic clarity that helps Eliot portray an authentic world, one full of contradictions and inconsistencies. By incorporating these arguments into Bloom’s interpretation, we can establish a much more comprehensive understanding the poem. In other words, Davidson’s argument about the themes of the proper and the improper help buttress my observations about the contradictory and inconsistent nature of both the poem and everyday life. In turn, these arguments help support Bloom’s overarching argument that the main theme of Eliot’s “The Waste Land” is the deadness of existence at large, especially one in a rootless world. The original introduction to “The Waste Land” was an epigram from Joseph Conrad’s Heart of Darkness, “Did he live his life again in every detail of desire, temptation, and surrender during the supreme moment of complete knowledge? He cried in a whisper at some image, at some vision, – he cried out twice, a cry that was no more than a breath – The horror! The horror!” (Davidson 121). The Conrad quotation was later replaced with a passage from the Satyricon, on the advice of Ezra Pound who argued that the original quotation did not carry enough weight. As a result, according to Davidson, this change of epigraph marks the beginning of the tension between the proper and the improper (122). These themes of the proper and the improper not only create a thematic clarity within the poem but also help establish the idea that life, unlike death, is full of contradictions and inconsistencies. tension between the proper and the improper. The Satyricon quotation references the story of Sibyl who tries to escape her life of immortality by actually dying. Unlike the Heart of Darkness, this story is much more obscure for modern and contemporary readers and, as Davidson points out, perhaps used as a “scholarly apparatus” in order to establish a “respect for tradition” (122). In order to take it a step further, I would argue that once Eliot establishes the proper by using this classical quotation in the beginning of the poem, he immediately obliterates it in the first stanza. The opening lines of poem begin with an examination of nature from the third person and morph into a first-person experience of a particular season, summer. The only separation between the idea of summer and the narrator is a semi-colon. “With a shower of rain; we stopped in the colonnade” (Eliot 19). This transition from a highly proper and traditional reference to an improper, almost colloquial style is swift and uncompromising and continues throughout the rest of poem. Tension and contradictions are also introduced in the form of content. For example, Sibyl’s yearning for death in the Satyricon quotation is in stark contrast to the representation of death in the opening lines of the first stanza. The narrator in the opening lines sees death everywhere, thus appears to recoil against the thought of it. This is particularly evident in the way that Eliot chooses to introduce the concept of spring. Instead of presenting spring as a rebirth, a time of ecstasy, bliss and happiness, Eliot presents a description of a land full of apathetic death. The poem starts with a categorical statement that “April is the cruelest month” (Eliot 1). Eliot then elaborates as to why by contrasting it with the other two seasons, winter and summer. But instead of portraying winter as a cold, dark, and barren season, Eliot emphasizes that winter “kept us warm” (5) by “covering Earth in forgetful snow” (5-6). Summer is likewise presented in a positive light with its occasional showers and pervasive sunlight. Trapped within these two seasons is spring, a season that represents death but not the kind that Sibyl desires. Within the first stanza, Eliot takes the reader from setting to action without bothering with a line break and then blurs the boundaries between the proper and the improper even more. Sometimes he’s not even bound by one language. For example, line 12 is entirely in German, with a translation in the footnote. The use of footnotes and narration, “he said, Marie,/Marie, hold on tight” (Eliot 15), within the poem further indicate that any sense properness and respect for tradition have been all but forgotten. The proper and the improper are also noted in a more detail oriented analysis of Michael H. Levenson’s A Genealogy of Modernism: A study of English literary doctrine 1908-1922. He examines the grammatical use of pronouns within the poem, noting that readers “want to identify the ‘us’ that winter kept warm with the ‘us’ that summer surprised, and with the ‘we’ who stop, go on, drink coffee and talk” because that is how readers expect pronouns to behave, “same referents unless new antecedents” (Levenson). Unfortunately this is not possible. “If the pronouns suggest a stable identity for the speaker” then a lot of everything else within this part of the poem “has already become unstable” (Levenson). In particular, the outside environment was already replaced by a cityscape and a series of participles were already replaced with “a series of verbs in conjunction” such as “And went…And drank…And talked” (Levenson). As a result, Levenson concludes that there exists a tension between the speaker and his identity and that the speaker is either one person with a range of personalities or multiple people speaking as one. What this conclusion tells me is that the instability in the speaker’s identity contributes to the overall instability of the speaker’s world. Whether we assume that the speaker is one person with many personalities or multiple people speaking as one, the tension within this part of the poem is further aggravated by the change in language. Lines 1 through 11 are in English, line 12 is in German, and lines 13 through 30 are again in English. Even though there is a translation in the footnote below, the continuity of the piece is interrupted. Levenson refers to this line in German as “a new voice with a new subject matter, speaking in a language, resisting assimilation.” He concludes that it can be interpreted variety of ways because “in the absence of contextual clues, and Eliot suppresses such clues, the line exists as a stark unassimilable poetic datum” (Levenson). I grew this interpretation but do not think that it is wide enough. While Levenson examines the tension in the beginning of the poem and concludes that it is a complex system of similarities and oppositions, Davidson takes a broader approach to interpretation. Davidson views the tension as an oscillation between the proper and improper and concludes that it is this oscillation that helps Eliot establish a number of contradictory themes within the poem. While I agree with both Levenson and Davidson, I tend to side more with Davidson’s interpretation because it appears to me to be more comprehensive. As a result, I would like to take the time to examine certain lines more closely. For example, the second part of the second stanza is perhaps best explained by the line that shows up in the first part of this stanza. In the second part of the stanza Eliot writes,“And the dead tree gives no shelter… And the dry stone no sound of water. Only/There is shadow under this red rock/(come in under the shadow this red rock),/And I will show you something different from either/Your shadow at morning striding behind you/or your shadow at evening rising to meet you;/I will show you fear in a handful of dust” (23-30). These lines contain a plethora of images centered on shadows and red rock. The narrator asks the reader to join him under the shadow of a red rock so that he could show him something he had never seen before. Thus the interpretation that “shadow” should be representative of death is confirmed by the image of “fear in a handful of dust” (Eliot 30). However, this interpretation is not that simple. Since Eliot continues to play with concepts of proper and improper, this oscillation between the proper and the improper forces the reader to never feel settled or calm. Thus just as the reader begins to feel at ease with the idea that the “shadow” and “a handful of dust” are representative of death, Eliot throws in a curveball in German, from Tristan and Isolde. The translation is again found in the footnote below, “Fresh blows the wind toward home, my Irish child (i.e., sweetheart) where do you wait?” (Eliot 456). This traditional reference to a classical text, an example of the proper, appears completely at odds with the previous interpretation and understanding. Thus the answer, or perhaps one of the answers, lies in the first part of the second stanza where Eliot writes, “Son of man,/You cannot say, or guess, for you know only/A heap of broken images” (20-22). It appears that this line holds the key to understanding the poem and its many contradictions. In particular, it is as if Eliot is saying that individuals, and life in general, are like “The Waste Land,” the sum of their parts, and that none can be understood as a whole by laying aside their many contradictions and inconsistencies. Levenson sees these contradictions and inconsistencies on a micro level. He analyzes the grammar, pointing out that lines 1 and 6 both use of present participles, lines 5 and 18 both use personal pronouns, lines 8 and 12 both use German, and lines 10 and 16 both use the conjunction ‘and.’ He concludes that both continuity and discontinuity are inconsistent. Davidson’s interpretation, on the other hand, is more macro but not as macro as Bloom’s. Davidson points out that it is the poem’s contradictions, its “lack of thematic clarity and its careful refusal [to make] connections between images” that leaves the poem open to interpretation (122). Davidson further argues that the poem treats “myth, history, arts, and religion as subjects to the same fragmentation, appropriation, and degradation as modern life” and thus its power “comes from its refusal to supply anything to appease wanting for propriety” (123). I agree with this interpretation and see Eliot’s oscillations between myth and everyday life, shadows and light, water and desert as a way to emphasize the fragmentation of life. The contradictions of the world around us contribute to the uncertainty of everyday life and Eliot’s portrayal of these contradictions within the poem is an illustration of the uneasiness of life. As a result, life limited by certainty, one lacking confusion, risk, and loss, becomes immortal or dead and something of a barren wasteland that Sibyl experiences. As previously mentioned, of the three critics, Bloom’s interpretation is the widest. Since I tend to see details as parts of a whole rather than standalone thoughts, I interpret the inconsistencies and contradictions within the poem as representatives of life in general. Thus I tend to side most with Bloom’s interpretation. Bloom uses the questions that Eliot poses within “The Waste Land” as the central theme to his argument. Eliot asks, “What are the roots that clutch, what branches grow/Out of this stony rubbish?” (19-20). He answers these questions, unsatisfactorily at best, in the lines following it, “Son of man,/You cannot say, or guess for you know only/A heap of broken images” (20-22). Whether the poem is interpreted on a micro level like Davidson or on a more macro level like Bloom, this is a key line to both of their interpretations. According to Bloom, this part is a reply to the preceding question. In other words, what Eliot is trying to say is that “you” as someone without roots can’t possibly know “what might serve for roots” (Bloom 26-27). Thus Eliot uses the poem to present a damaged and alienated person who is living in a barren world, both literally and metaphorically. Furthermore, he states that Eliot’s way of asking the question using images of “roots” and “stony rubbish” is an indication that he is seeking an answer that is familiar in form, namely one of fragmented images (Bloom 27). I agree with this interpretation. The speaker, also a “son of man” (20), does not have the answer. Bll that he knows is “a heap of broken images” (20-22). Thus by presenting the poem using fragments of thought, Eliot forces both the narrator and the reader to seek answers within these fragments. The question and answer session that appears within the poem also buttresses Bloom’s notion that “The Waste Land” is a kind of puzzle or riddle that the reader must figure out. Once the riddle is figured out, only then can the reader understand that the poem as something more than “a heap of broken images.” Though an individual might not always be successful, just as the speaker is not entirely successful, the pursuit is nevertheless noble. As Bloom points out, while the fragments are not entirely without worth, they are nevertheless fragments of “stony rubbish.” And as we have previously discussed, the “stony rubbish” can only support so much growth. Overall, I agree with Bloom’s interpretation but I do not entirely agree with his argument that the poem is like a puzzle or a riddle. A riddle or a puzzle has only one solution, one right answer, but the poem has too many contradictions and inconsistencies that prevent it from being figured out completely with only one right answer. Thus a better metaphor for “The Waste Land” would be a differential equation, a mathematical equation for an unknown function of one or several variables that relates the values of the function itself and its derivatives to various orders. To be more specific, “The Waste Land” is probably like the simplest kind of differential equation, an ordinary differential equation, in which the unknown function or the dependent variable is a function of a single independent variable. Undefined differential equations have infinite solutions but given the right inter-dependent variables, they produce unique solutions. As a result, a differential equation is a much better metaphor for “The Waste Land” than a puzzle or riddle. In the beginning, the poem seems to have infinite interpretations. But once constrained by certain limits in interpretation and understanding, the poem produces unique interpretations. These unique interpretations are of course dependent on and limited to the previously established constants. In conclusion, Levenson presented the most micro level interpretation by analyzing grammar and pointing out inconsistencies while Davidson presented a much more thematic interpretation by analyzing cultural details such as history and myth in order to present the argument that the poem is more than a collection of inconsistencies but rather an oscillation between the proper and the improper. Bloom’s interpretation is broader than both of these and one that I tend to agree with most. It appears to me that Eliot’s portrayal of the world, in a form of fragments, is a reflection of his own reality or perhaps, not be presumptuous, a portrayal of a reality in the beginning of the 20th century. As Bloom points out, this is a time of a “fragmentation of consciousness, of human faith, of the time and of the culture in which the poet lives” (27). Rather than thinking that some of these arguments are wrong or incomplete, I instead view them as valid given a certain set of conditions, like solutions to a differential equation. Davidson, Harriet. “Improper Desire: reading The Waste Land.” The Cambridge Companion to T.S. Eliot. Ed. Anthony David Moody. Cambridge: Cambridge UP, 1994. 121-131. Print. “Differential Equation.” Wikepedia.org. Wikepedia, n.d. Web. 27 July 2011. Eliot, T. S. “The Waste Land.” The Viking Portable Library American Literature Survey: The 20th Century. Ed. Milton R. Stern & Seymour L. Gross. New York: Viking, 1973. 455-472. Print. Levenson, Michael H. “On The Waste Land.” A Genealogy of Modernism: A study of English literary doctrine 1908-1922. Cambridge: Cambridge UP, 1984. Web. 27 July 2011. According to Harriet Davidson’s criticism, the original introduction to T. S. Eliot’s The Waste Land was an epigram from Joseph Conrad’s Heart of Darkness, “Did he live his life again in every detail of desire, temptation, and surrender during the supreme moment of complete knowledge? He cried in a whisper at some image, at some vision, – he cried out twice, a cry that was no more than a breath – The horror! The horror!” (121). The Conrad quotation was later replaced with a passage from the Satyricon, on the advice of Ezra Pound who argued that the original quotation did not carry enough weight. As a result, according to Davidson, this change of epigraph marks the beginning of the tension between the proper and poem (122). While the proper and the improper appear to create a lack of thematic clarity within the poem, they also help establish the idea that life, unlike death is full of contradictions and inconsistencies. In his essay, Davidson argues that the proper is under constant attack from the improper as a result of Eliot’s manner of both respecting and disrespecting tradition. The Waste Land mixes references to traditional texts with examples of “mutation, degradation, and fragmentation” in order to oscillate between these extremes and blur “the proper boundaries between things” (Davidson 122). Davidson makes note of this right in the beginning by pointing out that Eliot’s decision to change the epigraph to a more traditional reference is the first sign of tension between the proper and the improper. The Satyricon quotation references the story of Sibyl who tries to escape her life of immortality by actually dying. Unlike the Heart of Darkness, this story is much more obscure for modern and contemporary readers and, as Davidson points out, perhaps used as a “scholarly apparatus” in order to establish a “respect for tradition” (122). In order to take it a step further, I would argue that once Eliot establishes the proper by using this classical quotation in the beginning of the poem, he immediately obliterates it in the first stanza. The opening lines of poem begin with an examination of nature from the third person and morph into a first-person experience of a particular season, summer. The only separation between the idea of summer and the narrator is a semi-colon. “With a shower of rain; we stopped in the colonnade” (Eliot 456). This transition from a highly proper and traditional reference to an improper, almost colloquial style is swift and uncompromising and continues throughout the rest of poem. Tension and contradictions are also introduced in the form of content. For example, Sibyl’s yearning for death in the Satyricon quotation is in stark contrast to the representation of death in the opening lines of the first stanza. The narrator in the opening lines sees death everywhere, thus appears to recoil against the thought of it. This is particularly evident in the way that Eliot chooses to introduce the concept of spring. Instead of presenting spring as a rebirth, a time of ecstasy, bliss and happiness, Eliot presents a description of a land full of apathetic death. The poem starts with a categorical statement that “April is the cruelest month” (Eliot 456). Eliot then elaborates as to why by contrasting it with the other two seasons, winter and summer. But instead of portraying winter as a cold, dark, and barren season, Eliot emphasizes that winter “kept us warm” by “covering Earth in forgetful snow” (456). Summer is likewise presented in a positive light with its occasional showers and pervasive sunlight. Trapped within these two seasons is spring, a season that represents death but not the kind that Sibyl desires. Within the first stanza, Eliot takes the reader from setting to action without bothering with a line break and then blurs the boundaries between the proper and the improper even more. Sometimes he’s not even bound by one language. For example, line 12 is entirely in German, with a translation in the footnote. The use of footnotes and narration, “he said, Marie,/Marie, hold on tight” (Eliot 456), within the poem further indicate that any sense properness and respect for tradition have been all but forgotten. As Davidson points out, the oscillation between the proper and the improper helps Eliot establish a number of contradictory themes within the poem. I agree with this interpretation and like to take the time to develop it in more detail. For example, the second part of the second stanza is perhaps best explained by the line that shows up in the first part of this stanza. In the second part of the stanza Eliot writes, “And the dead tree gives no shelter… And the dry stone no sound of water. Only/There is shadow under this red rock/(come in under the shadow this red rock),/And I will show you something different from either/Your shadow at morning striding behind you/or your shadow at evening rising to meet you;/I will show you fear in a handful of dust” (456). These lines contain a plethora of images centered on shadows and red rock. The narrator asks the reader to join him under the shadow of a red rock so that he could show him something he had never seen before. Thus the interpretation that “shadow” should be representative of death is confirmed by the image of “fear in a handful of dust” (456). However, this interpretation is not that simple. Since Eliot continues to play with concepts of proper and improper, this oscillation between the proper and the improper forces the reader to never feel settled or calm about a particular interpretation. Therefore just as the reader starts to feel comfortable about the idea that “shadow” and “a handful of dust” are representative of death, Eliot throws in a curveball from Tristan and Isolde, “Fresh blows the wind toward home, my Irish child (i.e., sweetheart) where do you wait?” (456). This traditional reference to a classical text, an example of the proper, appears completely at odds with the previous interpretation and understanding. Thus the answer, or perhaps one of the answers, lies in the first part of the second stanza where Eliot writes, “Son of man,/You cannot say, or guess, for you know only/A heap of broken images” (456). It appears that this line holds the key to understanding the poem and its many contradictions. In particular, it is as if Eliot is saying that individuals, and life in general, are like The Waste Land, the sum of their parts, and that none can be understood as a whole by laying aside their many contradictions and inconsistencies. Just as Davidson points out, it is the poem’s contradictions, its “lack of thematic clarity and its careful refusal of connections between images” that “makes The Waste Land particularly open to different interpretations” (122). Davidson further argues that the poem treats “myth, history, arts, and religion as subjects to the same fragmentation, appropriation, and degradation as modern life” and thus its power “comes from its refusal to supply anything to appease wanting for propriety” (123). I agree with this interpretation and see Eliot’s oscillations between myth and everyday life, shadows and light, water and desert as a way to emphasize the fragmentation of life. The contradictions of the world around us contribute to the uncertainty of everyday life and Eliot’s portrayal of these contradictions within the poem is an illustration of the uneasiness of life. As a result, life limited by certainty, one lacking confusion, risk, and loss, becomes immortal or dead and something of a barren wasteland that Sibyl experiences. William Wordsworth wrote “Daffodils,” the quintessential lyric and song poem of the Romantic period, in 1804 and first published it in his Poems in Two Volumes in 1807 (Wordsworth, 351). In his reading of “Daffodils” in William Wordsworth, Geoffrey Durrant argues that the poem is “an account of the experience of poetic creation” (20). In other words, Durrant sees the poem as Wordsworth’s way of relating the experience of writing poetry by grounding that experience in something to which the reader can relate, i.e. remembering the beauty of daffodils. While I agree with some of his argument and many of his supporting statements, I would not go as far as to embrace his interpretation as a whole and instead interpret the poem on a more psychological level. Using daffodils as concrete symbols of other people’s happiness, Wordsworth’s speaker undergoes a change from someone who is alienated and lonely to someone who, while still alone, is no longer lonely. The poem begins with “I wondered lonely as a cloud/That floats on high…” (Wordsworth, 385). For Durrant, these lines are representative of a feeling of aimlessness in which the speaker cannot fully relate to the outside world (20). I agree with his interpretation and give him credit for helping me understand this poem on a more psychological level. To me, Wordsworth’s mention of height is representative of space and emptiness which reinforces the idea that the speaker is in a mood that makes it impossible for him to feel connected to the world. I would not, however, go as far as to conclude that the speaker is depressed. 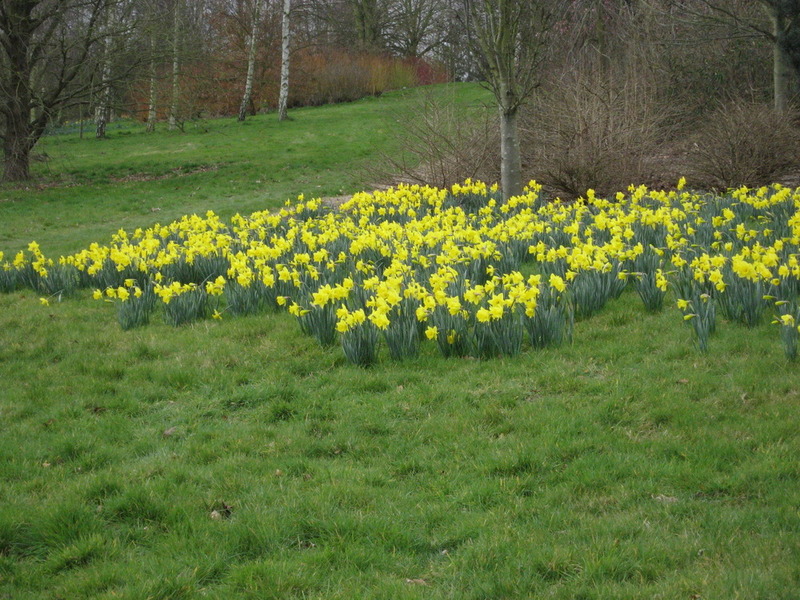 Durrant argues that seeing the daffodils as a crowd indicates “a sudden shift of attention and a sudden energy of mind” and goes on to interpret these words to refer to an “exhibit that is turned into a pattern…the order of an army like the host of angels in Paradise Lost” (Durrant, 20). Since I never read Paradise Lost, I cannot speak to this part of his interpretation. Instead, I am prone to interpret the “crowd” of daffodils as a crowd of people who are busy “fluttering and dancing” (Wordsworth, 385). Rather than a collection of flowers, the speaker sees the daffodils as a collection of people who are dancing because they are joyful and full of life. Since he admires this mass of happiness from afar, he is unable to truly connect to them on a personal level. By bringing up ideas of “indifference and passivity,” Durrant’s initial remarks helped me understand the poem in an entirely new way and I now see little beyond what he called the poem’s “mood of detachment” (20). However, rather than agree with Durrant’s statement that Wordsworth used the word “golden” in order to organize the poem and give it “coherence and vividness,” I tend to see the choice of word as a reflection of the speaker’s mood (20). Wordsworth uses the word “golden” to describe the daffodils in order to give their “crowd” more strength (385). Golden is a much more powerful word than yellow because it is calm and soothing without the hostility of being bright. Durrant goes on to say that, as a poet, Wordsworth imposes the “brightness of his own imagination” “upon the disorderly facts of the world” in order to offer his readers not only the poem as a result but also “an account of” the poetic process as a whole (20). While I do agree with Durrant’s conclusion of this part in his analysis, I cannot go as far as to interpret the poem as a whole to be representative of the poetic process. In the next part of his analysis, Durrant points out that Wordsworth does not spend much time describing the daffodils in detail and chooses to instead focus more on what their relationship to the natural world means to him (21). The daffodils are “Beside the lake, beneath the trees” and “They stretched in never-ending line” (Wordsworth, 385). Here Wordsworth is not speaking simply about the daffodils and their unique place in the world but rather of his speaker’s perception of them. Like all things, daffodils are products of their surroundings and their beauty is either enhanced or diminished depending on the environment. Since the speaker finds the daffodils within a landscape that showcases their beauty, the daffodils are able to capture and hold his interest. This would not be the case, however, had he spotted them instead in a garden. In a garden and in close proximity to other golden flowers, like yellow roses and daisies, the daffodils would not naturally stand out against the greenery and, as a result, their impact on their viewer would be diminished. Likewise, the speaker’s internal environment also contributes to his interpretation of the daffodils’ beauty. Wordsworth’s internal state allows him to experience these ordinary yellow flowers near a lake in such a way that he is inspired to create a poem that is anything but ordinary. Therefore, I would argue that Wordsworth does not spend much time describing the daffodils themselves but rather their power on the speaker in order to point out that their power has less to do with their unique attributes and more to do with the external and internal environment that allows those attributes to shine. Durrant goes on to discuss the spatial location of the daffodils in comparison to the lake and trees. He notes the importance of the curve and calls it “the curve of necessity” which he in turn relates to “the very curve of the heavens” (21). He then concludes that Wordsworth ““shows the daffodils as part of a universal order, as growing where they do because of the natural law which dictates their existence” (21). I agree with his analysis and conclusion but I would like to expand this interpretation by relating it to what I mentioned before. In particular, while it is natural law that dictates the daffodils’ existence by allowing them to grow, it is man’s interpretation of their place in the natural order that draws attention to their happy dancing and the speaker’s own alienation. Durrant appears to agree because he points out that “in all creation man seems to be the only creature that is capable of feeling not home” (21). While I appreciate that we are in agreement regarding the speaker’s disconnect, I nevertheless have to point out that I do not agree with Durrant’s conclusion that men are the only creatures who are able to feel alienated from the natural world. Wild horses and burros still roam the high deserts of the American West. Who is to say that they, or their ancestors who were first let free, did not at one point feel alienated from their environment? No, perhaps it is not that man is the only creature capable of feeling disconnected from his environment but rather that man is the only creature capable of expressing this alienation in words. Durrant continues his analysis by discussing other elements regarding the spatial organization of the poem. In particular, he interprets the fluttering of the daffodils as “a harmonious movement in which a pattern may be discerned” (Durant, 21). The pattern is not entirely discernible to me and I would instead like to stick to Durrant’s interpretation that speaks of the poet’s mind. The last stanza contains the lines, “And then my heart with pleasure fills/ And dances with daffodils” (385). Durrant interprets these lines as “the poet’s power” to not only organize the experience of writing poetry “so that it is coherent and delightful” but to also recall the experience at a future time (24). While I see what Durrant means, my interpretation relates less to the process of writing poetry and more to Durrant’s initial psychological assessment of the poem’s meaning. To me, the speaker lying on the couch “in pensive mood” and reliving his time with the daffodils means nearly what Wordsworth says, that the speaker is imagining the happiness he saw beneath those trees (386). As Durrant accurately points out, for the speaker “the experience is not lost but may be recovered when it is wanted” even though the memory and the imaginary daffodils (and the imaginary happiness) are not quite the real thing (24). In conclusion, at the end of the poem, Wordsworth refers to the daffodils as a memory and states that they “flash upon the inward eye/ Which is the bliss of solitude” (386). Durrant interprets that this happens as a result of “the poetic process” that “makes the experience [of the daffodils] available again” (24). While I do not entirely agree with Durrant’s overall interpretation that the poem is about the process of writing poetry, given that premise his analysis is appropriate. I do however agree with his position that the speaker undergoes a change throughout the poem. In the beginning of the poem, the speaker appears alienated, as someone striving to experience the joy he sees before him. By the end of the poem, the speaker, though still alone, is no longer lonely. In the last stanza, the speaker is “in vacant or in pensive mood” until “they flash upon the inward eye/Which is the bliss of solitude” (Wordsworth, 386). Prior to remembering the daffodils, the speaker is either at peace or lost in thought, but no longer lonely, and after he remembers the daffodils, the speaker is content. By noting the speaker’s ability to recollect the daffodils and be thankful for the time he has to do this, Wordsworth shows that the speaker’s solitude is blissful and that this kind of solitude is completely devoid of melancholy or alienation. Durrant, Geoffrey. William Wordsworth. London: Cambridge U.P., 1969. Web. 14 June 2011. <http://books.google.com/books?id=fjo4AAAAIAAJ&pg=PA18&dq=wordsworth+%22the+daffodils%22+literary+criticism&hl=en&ei=7hr4TcXzIIjjiALcju39DA&sa=X&oi=book_result&ct=result&resnum=4&ved=0CDwQ6AEwAw#v=onepage&q&f=false>. Jessica Wordsworth. London: Penguin, 2003. 358-386. Print.